Some more extra things with Gutenberg that are on the wild side of advanced. Making a straight forward block to insert content in Gutenberg is (relatively) easy. I hate using the word ‘easy’ here, because in order to do it you will need to master a whole new world of coding, but all things considered, yes. It is easy. In fact, Gary (aka Pento) wrote a sample plugin that will let you convert a shortcode to a Gutenberg Block. I myself have written a mildly complicated Spoiler Block (there’s a new version of it I will share soon). But then the day happened that my cohort in lesbian TV crime, Tracy, expressed annoyance at how Gutenberg destroyed her listicle. What is a Listicle? #What is a Listicle? Have you seen those posts that show you the top ten ways to LifeHack your used egg cartons? Those are listicles. They’re lists (list) articles (icle). Makes sense, right? Listicles have a pretty basic format as well, there will be a header with some sort of numerical mark, then content with images etc. This repeats for the number of times you have an article. Most people make them by hand by manually editing the numbers in their header. That’s all well and good until you want to craft better formatting and have a listicle look somehow ‘different’ from the rest of your content. Maybe you want them to have a special background color, or a different design for the header. What this does is create a CSS counter and increment it every time you use <dt> creating an auto incrementing list. 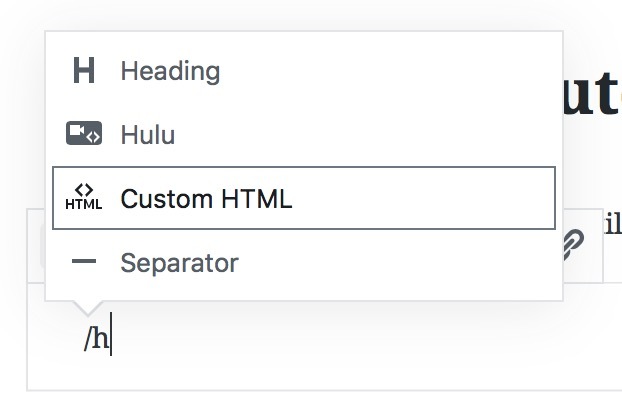 Now, if you know the HTML, you can still do this in Gutenberg in HTML by using the HTML block. Example of summoning the Custom HTML block. But if you don’t know HTML, then this is a bloody nightmare to handle. And part of the reason why I’m very pro-Gutenberg is that it’s 2018, and expecting people to know all the myriad magical steps of HTML, in order to create a webpage, feels passé. No, it feels restrictive. We can’t expect websites to advance and become more than just pages if we don’t give them the tools. It sounds incredibly complicated, and sadly the perfect version was so difficult I actually started with a pared down version. The problem here is that I end up having a separate dl for each block. I can work around it with some CSS magic, but it’s not perfect. So I knuckled down and actually wrote the code that does exactly what I want. Whew. … Actually I’m going to do something I hate and that’s link to an external directory. I’ve build out Listicles for Gutenberg for you to peruse and fork and enjoy. Or even use if you want, becuase it does work. But it’s big. No, it’s huge for an in-post example. And to explain everything line by line wouldn’t help. If you go to the repository, the Gutenberg source code is located in /src/ – that’s where most (if not all) of your work will happen. The real trick of it all was the copious use of templates. That too illustrates some of the concerns people have, and rightly so, about blocks being incredibly more complicated than they need to be. And yet, having gone through the exercise myself, I think that it’s perhaps not going to be that much of a drama. For those of use who generally just make new shortcodes, the world won’t change too much. Gutenberg supports inline shortcodes, after all, which is the majority of what people need from it. We want to be able to make our own embed blocks, which again isn’t terrible, and when someone gets to the complicated point of needing something advanced like a listicle, well eventually there will be a plugin that will handle this better than a shortcode. Or you could just use that HTML block.